Home » What is MDS? 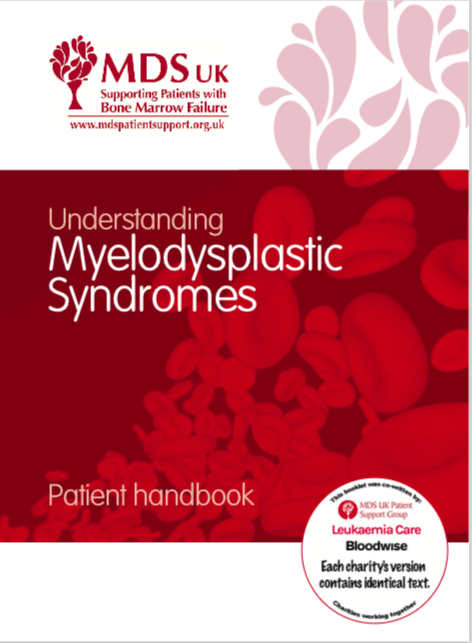 Learn more about Myelodysplastic Syndromes (MDS) and use this information to discuss with your consultants and nurses. Evidence tells that being actively involved in your own treatment can improve your outcomes and experience of the disease. All the articles on our website have been properly vetted by MDS experts for scientific accuracy. MDS stands for Myelodysplastic Syndromes, and it is a group of malignant blood disorders in which the bone marrow fails to produce healthy blood cells. All types of blood cells can be affected, causing a range of symptoms. Learn more about the bone marrow in the MDS Foundation leaflet What does my bone marrow do? What is the meaning of Myelodysplastic Syndromes? Then, the word Myelodysplastic refers to the malfunction of the bone marrow in producing the correct quality of blood cells. MDS is a form of bone marrow cancer, although its progression into leukaemia does not always occur. The failure of the bone marrow to produce mature healthy cells is a gradual process, and therefore MDS is not necessarily a terminal disease. In some patients, however, MDS can progress to AML, Acute Myeloid Leukaemia. In AML, abnormal cells grow very rapidly, building up in the bone marrow and blood. 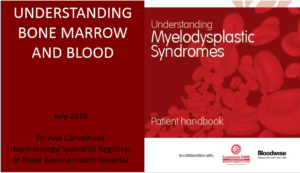 This presentation will help you understand more about the bone marrow, the blood and how they are affected in MDS. What are MDS Early Signs and Symptoms? A person with MDS will suffer from chronic tiredness and weakness due to the low levels of haemoglobin in the red blood cells, which carries oxygen to the body. In MDS, platelet numbers, which prevent bleeding and bruising, can often be very low. This can result in spontaneous bleeding and bruising. If an injury is sustained blood loss may be excessive. Clearly these factors result in many constraints and difficulties. Platelet transfusions may be required on a regular basis. When white cells numbers become very low (as they often do in MDS) the body is unable to fight off infection normally. This results in a greater than usual incidence of infections which take longer than usual to clear and might require hospitalisation. White cells cannot be given by transfusion. There are a number of options to treat MDS. Treatment decisions are based on the International Prognostic Scoring System (IPSS-R). What is the Prognosis for an MDS Patient? Prognosis means the expected outcome or survival from MDS. Your prognosis depends on many factors including those not related to MDS, such as your general fitness and age. Because each person is unique, and each person’s disease is different, a prognosis can be difficult to make. Also, how a disease progresses over time is unpredictable. However, to allow your doctor to make the right treatment choices, MDS doctors and scientists around the world have designed a number of systems by which we can score how your MDS is likely to behave.